Soccer fans on the new Russian law, their behavior in stadiums and hopes for the World Cup at home. This summer, President Vladimir Putin signed a law that increased the penalty for fans who disturb the public order to €340 ($461), determined that they must do up to 160 hours of community service, and banned them from attending matches for up to 7 years. The police were ordered to create a “blacklist” of unruly fans, and stadium owners were instructed to install video surveillance systems. The law, called the “Law on Sports Fans,” has divided Russian society into three groups. One believes that the new legislative measures will ensure tranquility in sports stands. The second considers this just another move by the authorities to tighten the screws. And the last group worries that such repressive policies will result in new conflicts in the stadiums. The most recent fan scandal broke out in S. Petersburg on Sept. 14: During a match with the Grozny Terek team, Zenith fans burned the flag of Chechnya. A video of this vandalism found its way to YouTube and all of Europe was talking about it the next day. Zenith had to pay a steep fine, and FIFA and UEFA officials once again noted the disgraceful behavior of Russian fans. However, this story is too complicated for one-sided judgments. “The burning of the Chechen flag was in response to provocation by Anzhi fans,” says Zenith fan Edward Serzhan, a journalism professor. Many fans of Moscow clubs and of the St. Petersburg club Zenith may be called nationalists: Radical right-wing ideas are always popular among them. The last outbreak of activity from these radicals was their collision with law enforcement in the center of Moscow on Manezh Square, in December 2010. Then, about 2,000 soccer fans eloquently expressed their position, following the murder of Spartacus fan Yegor Sviridov by natives of the Caucasus; fans shouted nationalist slogans and burned flares. Many of their faces were covered in medical masks. Hundreds of fans were arrested after three hours of fierce battles with the police. 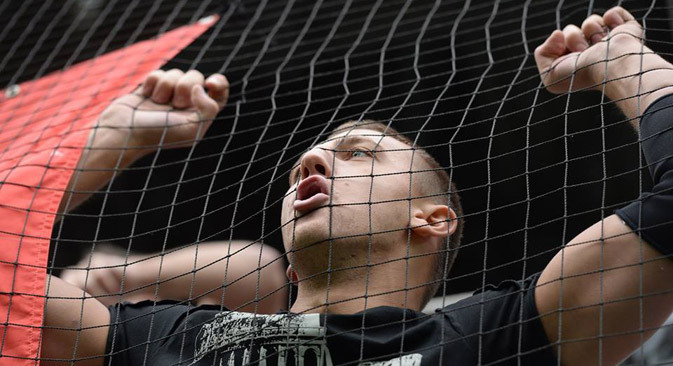 Yevgeny Selemenev, a 20-year-old fan of Moscow’s Spartacus thinks that the promulgation of the “Law on Sports Fans” will not make Russian stadiums more secure. “Random people very often fall under the arm of the police at matches. In Serzhan’s opinion, new infrastructure for the World Championship and the confidence and trust of club leaders in their fans will help to remedy the current situation. Sergei Altukhin, a fan of Kuban — the most highly attended club in Russia in 2012 (average attendance is 21,000) — believes that the restrictions will only make the fanatics more inventive. “A complete ban on fireworks is not the most logical solution to the problem: Matches lose their colorfulness,” he says. Dan Darby, an English fan who roots for all of the Russian clubs in European competitions, considers Russian fanatics to be no different from those in other countries and thinks they behave themselves perfectly well. “I lived in Russia for a little while. I speak Russian and even once covered Russian soccer for the Associated Press. Moreover, I still do predictions on RFPL matches for a bookmaker office and watch a few games every weekend. Russian fans are really nice people. They support their teams well and cheer for soccer with all their heart,” says Darby. The security director for the Russian Football League, Alexander Meytin, sees only positives in the new law. “The appearance of the ‘Law on Sports Fans’ was dictated by the reality of life itself. At least the responsibilities of both parties — those who watch and those in charge of their security—are clearly defined thanks to it,” Meytin says. New amendments to the “Law on Sports Fans” could be added in the near future. One of the most important changes might be that Russian fans will have to buy tickets with their domestic passports. In the opinion of officials, such a rule will make information available on every soccer fan, which, in turn, will make it possible to clamp down more effectively on those who interfere with true soccer lovers’ enjoyment of the game. No such law exists in any other country yet.